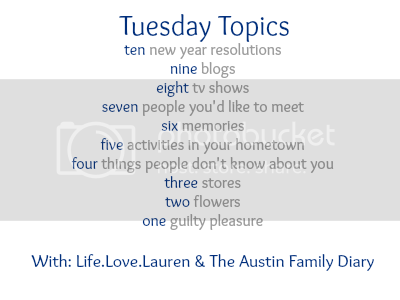 Two flowers…seems like an odd topic choice! 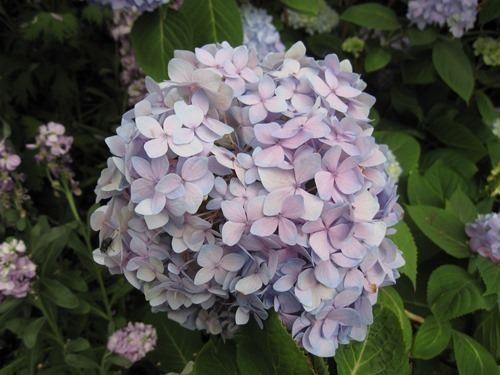 So I figured I’d share two pictures I’ve taken myself of flowers. 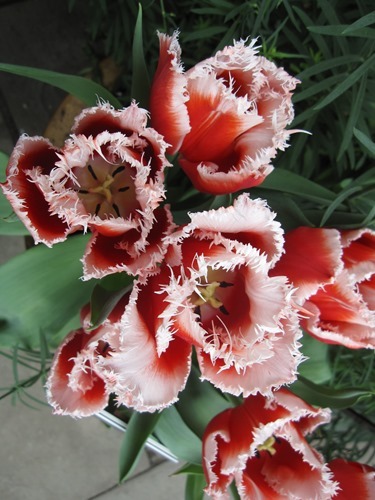 These were taken at the NY Botanical Garden on Mother’s Day in 2009. Pretty huh? And you know what else is pretty? This box of goodies I received yesterday from my Cara Box swap partner! 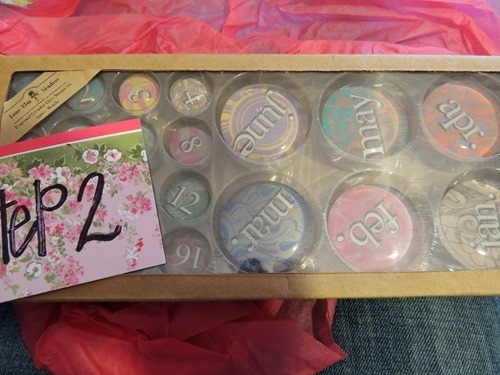 Kaitlyn, the creator of the Cara Box Exchange, matched swap partners based on their state of residence, so both the person I sent to and the person I received from live in Kansas. I was imagining a 3 person meet up, but one of us doesn’t live close by the others and then things got too busy (and snowy) to plan a meet up anyway. So I sent to Christina Marie, who in turn sent to Avery, and Avery sent to me. This month’s theme was “date night,” which could be anything that your partner would enjoy doing on their ideal evening. Want to see what I got in my box? 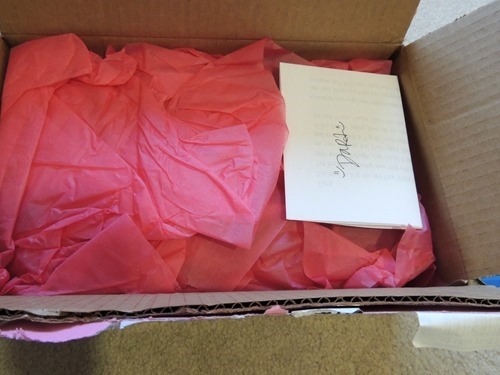 Pretty pink packaging! Avery included a typed note explaining that my box contained the four steps to my perfect date night. She chose to send me a date with myself – which I definitely appreciate! Avery owns a store in Wilson, KS called Bloom, and three out of the four items are best sellers at her store, how cool is that! Each step is labeled! 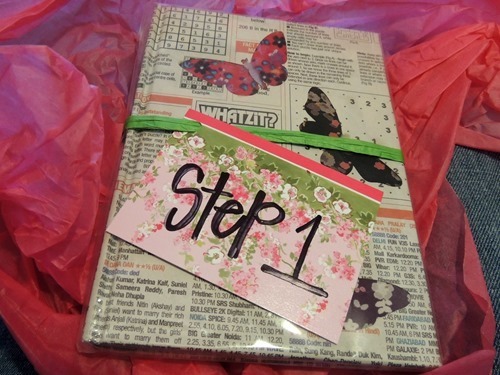 Step 1: A notebook to keep organized with. So cute, I love the butterflies and the newspaper print! Step 2: Fun calendar magnets. I may have to make a calendar using these! 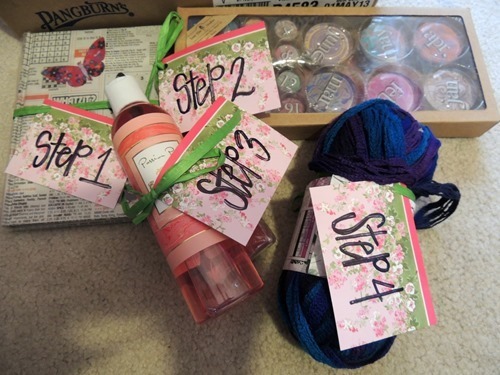 Step 3: Camille Beckman soap and shower gel in Passion Pear – yum! 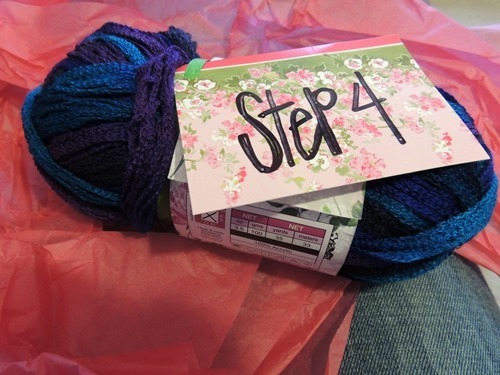 Step 4: Really neat yarn with instructions to knit a scarf. It’s not regular yarn that I’m used to knitting with so I have to learn how to use it! I am looking forward to using all of the things Avery sent me! Thanks so much Avery! The winner of the Premama vitamin drink has been chosen – the winner is Michelle Pickett! Thanks for playing!